Gorgeous window treatments help your home shine during the holidays! Last week, we talked about how easy it is to brighten your home for the holidays with York Sure-Strip wallpaper. This week, we have an even easier way to prepare your home for cozy family memories: window treatments! You can lend your home some warm, bright accent colors with drapes or shield your family from the bright sun with blinds. There are so many choices for style, shape, and size; we’re sure we will be able to find you what you the right window treatment to fit the personality of your home. Come to our showroom to browse through our full-size fabric library of Graber, Kirsch, and Hunter Douglas designs. You can also make an appointment with a design consultant to discover what will truly look best in your home. Nothing warms up your home like brand new window treatments! Drapes and curtains are a classic choice for beautifying windows. There are an almost unlimited number of styles and color combinations to choose from. 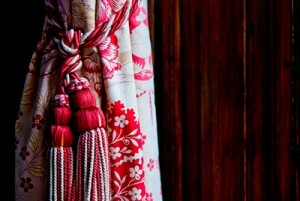 There are so many ways to hang curtains; you can drape them to one side, hang them vertically from a rod, or pleat them. The advantages of curtains and drapes are numerous. Not only do drapes and curtains provide a barrier from sun and cold when they’re closed, but they also keep dust from accumulating in a room. Curtains and drapes are great for privacy, for insulation, but most of all, for decoration! 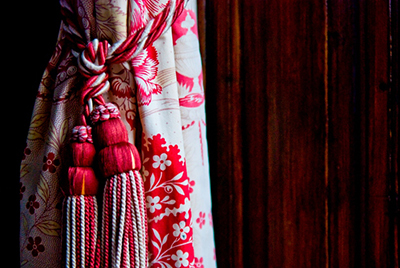 Curtains and drapes can act as a bright accent color or can bring a subtle elegance to a room. They are versatile, varied, and always make a room look warmer and more inviting. Blinds are especially great for rooms that face the sun and are still used often. If you want to use a room but don’t want the room to be quite as dark as they would be if you drew the curtains, then blinds are the way to go. We offer custom blinds to fit any shape or size of window. You can equip your windows with vertical or horizontal blinds made of materials that easily blend in with the rest of your home. You can even opt for soft-colored and -textured shades that give your room a cozy feel when in use. Wood shutters are similar to blinds but offer a more permanent. Light can be filtered through the shutters to varying degrees, and when the shutters are completely closed, they’re one of the most effective window treatments for keeping light out. Although shutters are a permanent window treatment, they have been in use for decades, so you can be sure that they won’t go out of style. They also tend to increase a home’s value. They’re easier to clean than drapes and help regulate temperature during the hot summer months. If you are thinking of adding some regal flair to your home for the holidays, consider some timeless shutters!